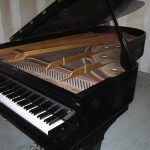 George Steck Piano Co.– NY, New York. 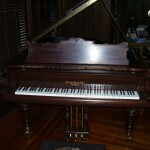 7′ satin Mahogany case has been completely refinished. Complete interior restoration. Tone quality of bass strings is strong and sustaining. Action has been completely rebuilt (New hammers and whippens) and regulated. New keytops w/one-piece fronts installed. New polished brass pedals, adjustable rods and casters. $18,500.